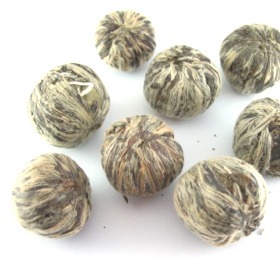 Dragon Ball Yin Zhen white tea is made from Silver Needle leaves that are hand-tied into a ball. It is also known as Gong Yi Tea. Once the leaves are steeped they swell to create something that looks like a peony bloom. Display teas are made to be enjoyed for the show presented while steeping. Dragon Ball Yin Zhen White Tea is best enjoyed in a wine glass or any glass teapot. Sweet and smooth taste with delicate aroma. The ball measures approximately 3cm by 3cm. Upon infusion, the tea leaves slowly open up like a blooming flower. Beautiful display. We recommend using clear glass cup or wine glass for this tea. Rinse the tea cup with hot water. Use only one piece for each cup. Steep tea leaves in hot water at 70°c (158°F) to 80°c (176°F) for 1 to 2 minutes for the first and second brewing. Gradually increase steeping time and temperature for subsequent brewing. The tea is just fine. I found the communication of the site owner unprofessional. One never begins an e-mail to a customer "Hey, can you check this?" Single-line message, without self-introduction and address to the recipient, made the owner appear professionally lazy toward customer care. I thought these were plain white tea bundles, but they actually have flowers inside! The flavors vary from bloom to bloom, so the variety is nice. Be careful to use cooler water, though, since its easy to make the tea bitter by oversteeping. delightful tea, as a hot and cold too. Good way to please your visitors. Soft, sweet taste, good looking, must-to-taste. fine tea with delicate taste and aroma. Perfectly looks in a transpsrent teapot. must-have. Very tastey, light and refreshing aroma.